The Mesa Arizona Temple (formerly the Arizona Temple; nicknamed the Lamanite Temple) is the seventh operating temple of The Church of Jesus Christ of Latter-day Saints (LDS Church). Located in the city of Mesa, Arizona, it is the first of six LDS temples built or planned in the state. The LDS temple in Mesa was one of the first to be constructed by the church. Similar to the Cardston Alberta Temple, the church decided to hold a competition for the design of the temple with the exception of only inviting three Salt Lake firms to participate. The winning design was proposed by Don Carlos Young, Jr. and Ramm Hansen. Announced in 1919, only seven years after Arizona had achieved statehood, it was one of 3 temples announced and constructed to serve outlying Latter-day Saint settlements in the early part of the century, the others being constructed in Laie, Hawaii and Cardston, Alberta. While none of the three settlements were particularly large in their own right, they were considered thriving centers of largely Latter-day Saint populations. The long and arduous trip to existing temples located in the state of Utah would prove costly and even dangerous for the faithful of the era, and temple attendance was (and is) an important part of the faith. As such, it was seen as necessary to construct temples in these communities. Numerous colonies had been set up in Arizona by the church during the last half of the nineteenth century, and plans had been discussed for a temple in the area as early as 1908, but the start of World War I stopped these for a while. The plan to build a temple in Mesa, Arizona was finally announced on October 3, 1919 and a 20-acre (81,000 m2) site was selected and bought in 1921. The site was dedicated shortly after on November 28, 1921 and on April 25, 1922 the groundbreaking ceremony took place. Heber J. Grant conducted the ceremony. Following the earlier traditions set forth in the building of temples, such as the Salt Lake Temple, the new structure in Mesa was a centerpiece of an organized and planned community for the faithful that lived nearby. Upon its completion in 1927 it was the third largest temple in use by the church and the largest outside of Utah, and remains among the largest temples constructed to this day. 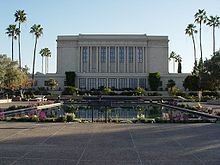 In a departure from the style of temples constructed prior, the Mesa temple (along with the temples in Laie and Cardston) was built in a neoclassical style suggestive of the Temple in Jerusalem, lacking the spires that have become a mainstay of temples built since then, and prior to the announcement and impending construction of the Paris France Temple it was the last LDS temple constructed without a spire. The temple is a neoclassical design featuring the primary structure atop a pedestal, a frieze, pilasters with Corinthian capitals (12 pair along the long side and 10 pair along the short side) and amphorae on fluted columns on the grounds. Below the cornice, eight frieze panels (carved in low relief) depict the gathering of God's people from the Old and New World, and the Pacific Islands to America. When construction was finished on the temple, the public was able to take tours through the temple. Two hundred thousand people were able to take a tour through the Mesa Temple. The temple was dedicated on October 23, 1927 by Heber J. Grant. By that afternoon, the temple was being put to use. In 1945, the temple was distinguished by becoming the first to offer temple ordinances in Spanish, the first time they were offered in a language other than English. The Mesa Temple was closed in February 1974, for extensive remodeling that equipped the ordinance rooms for motion-picture presentation of the endowment sessions, and that added a new entrance and an additional 17,000 square feet (1,600 m2), providing larger dressing rooms and increasing the number of sealing rooms. Spencer W. Kimball re-dedicated the temple on April 16, 1975. In May 2018, the temple closed for renovations that are anticipated to be completed in 2020. When the renovations are completed, a public open house will be held, followed by the temple being rededicated. Just north of the temple is a visitors' center where people can enjoy murals, videos, displays, and other activities. The visitors' center also houses a replica of a statue of Jesus Christ by Danish artist Bertel Thorvaldsen called the Christus. The visitors' centers and grounds are staffed by Mormon missionaries and the public is welcome to walk on the temple grounds and enjoy the well-kept gardens. During Christmas there is a light display and a nativity scene. During late March to early April, the temple hosts the Mesa Arizona Easter Pageant Jesus the Christ, which attracts approximately 150,000 people annually and is the "largest annual outdoor Easter pageant in the world." Notable presidents of the temple include David K. Udall (1927–34); Junius E. Driggs (1975–80); and L. Kenyon Udall (1997–2000). The current president is Kenneth M Smith (2017–). ^ The Church News Department Staff. "Mesa Arizona Temple". Church News. The Church of Jesus Christ of Latter-Day Saints. Retrieved January 11, 2011. ^ "Three Mormon Temples in the US to Close for Renovation: Upgrades planned for sacred buildings in Mesa, Baton Rouge and Raleigh". Newsroom. LDS Church. June 27, 2017. Wikimedia Commons has media related to Mesa Arizona Temple.